Adidas - adiRun 2.0 Shoes The adidas adiRun 2.0 shoes are a great everyday kids' shoe and a great value too. This classic lace-up features stylish leather overlays and a reflective toe cap detail for added safety in low light. 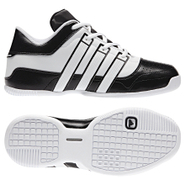 Adidas - Supercup Low Shoes The game's influence stretches far beyond the court in the adidas Supercup Low. This basketball-inspired shoe features a full grain leather upper to keep your active toddler comfortable all day. Adidas - Vulc Shoes On or off the tennis court these adidas Vulc shoes have a cool low-cut silhouette that blends textile and synthetic details in a fresh new style. Adidas - Superstar Inspired 2.0 CF Shoes Up up and away! 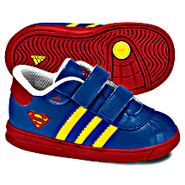 These adidas Superstar Inspired 2.0 CF shoes step your little superhero into a stylish pair of low-top kicks that feature convenient hook-and-loop comfort closures and a cute allover Superman design. 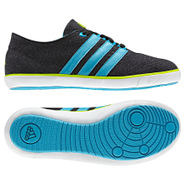 Adidas - Vulc Shoes These adidas Vulc shoes reinvent a popular street-ready profile for kids. The low-cut shoe features a classic vulcanized rubber outsole made fresh with a mix of new materials and a mud guard for extra toe protection. 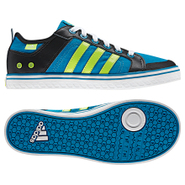 Adidas - Vulc Shoes These adidas Vulc shoes blend a casual low-cut profile with standout details. There's a cool star pattern on the vulcanized outsole shiny 3-Stripes and a mesh upper for lightweight comfort. 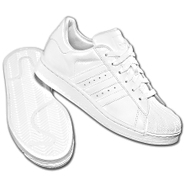 Adidas - Supercup Low Shoes The game's influence stretches far beyond the court in the adidas Supercup Low. 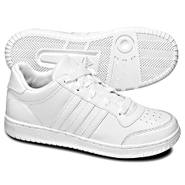 This basketball-inspired kids' shoe is made of soft full grain leather with a practical non-marking sole. 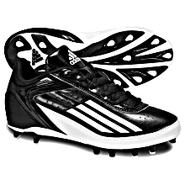 Adidas - Lightning Fly Low Cleats The faster they train the more they need the adidas Lightning Fly Low football cleats. These breathable kids' training cleats feature a lightweight upper and a TPU plate outsole for best performance on grass. Converse - A feminine take on a classic silhouette the Converse Little Girls' Chuck Taylor All Star Low Top Frilly Thrills delivers pretty girly style and durable design details for a sneaker she'll reach for again and again. Converse - Men's Chuck Taylor Low Top Sneakers from Finish Li Classic all-American style and comfort combine in the adidas Chuck Taylor All Star Ox. The soft canvas upper comes in a variety of colors for a versatile look. 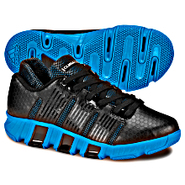 Adidas - CLIMA 360 Low Shoes When your moves are heating up the basketball court these adidas CLIMA 360 Low shoes keep your feet chill via 360 degrees of CLIMACOOL(r) ventilation TORSION(r) SYSTEM support and lightweight EVA cushioning. New Balance - Girls' 247 Casual Sneakers from Finish Line Low-key comfort reigns supreme on the New Balance Big Girls' 247 Casual Sneakers. 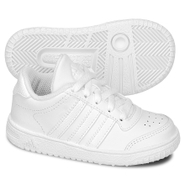 Perfect for your active kid these sneakers keep her feet supported as she climbs jumps and plays.